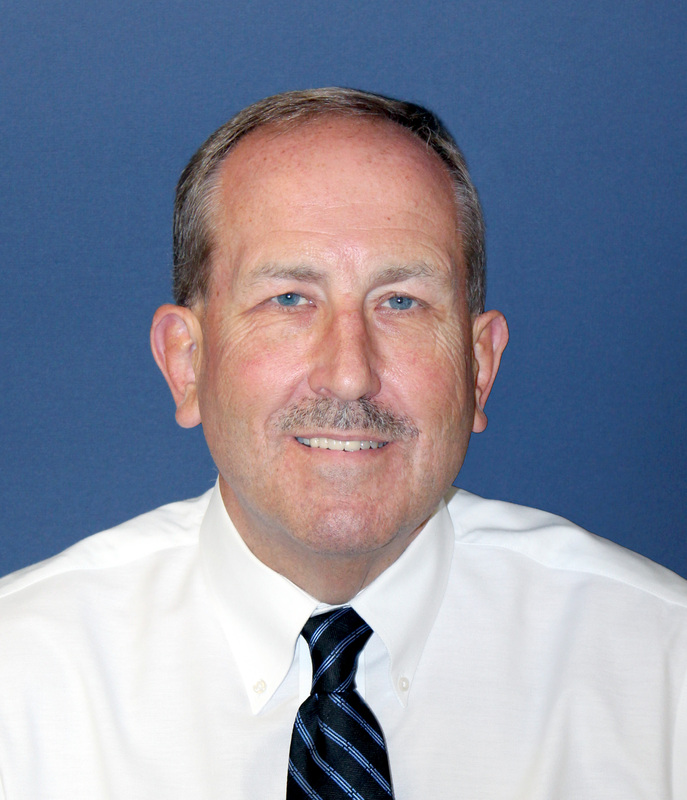 Mere days after he retired from a stellar 33 years of duty with the local Police Department, Richard Vibberts has joined the Goodwin College community in a critical role as Director of Campus Safety and Security. Vibberts is the first person to hold the new position, created to address the needs of a growing campus. He has already begun working for the College, with his first day on the job in mid-October. Earlier this month, Vibberts retired from the East Hartford Police Department, where he was a deputy chief and had served in many capacities throughout a career spanning more than three decades. Rich Vibberts will continue to serve the community as Goodwin College Director of Campus Safety and Security. As Director of Campus Safety and Security, Vibberts will lead the Department of Campus Safety, develop and implement projects and procedures, and coordinate emergency response protocols between the College and other agencies, including local and state police. “Working for Goodwin seemed like a natural way of paying it forward to the community where I have worked for the past 33 years,” Vibberts said. He began his career as an East Hartford police officer in 1980. Vibberts advanced through the ranks and was named deputy chief in 2002. Among his many duties were commanding and oversight of a 125-member police force, serving as a liaison between the police and town officials, preparing emergency response plans, and writing operational plans for large-scale special events such as UConn football games at Rentschler Field, the Hartford Marathon, and Riverfest. Goodwin’s campus expansion and establishment of its magnet school system present unique challenges to Vibberts. While headquartered on Riverside Drive in East Hartford, Goodwin’s classroom and office space extend throughout Main Street. Two magnet schools – the Connecticut River Academy and the Goodwin College Early Childhood Magnet School – are open on campus, and a third school will be opening the spring of 2014. Vibberts said he is ready for the challenge and looks forward to continuing to serve a community he has come to love. He plans to employ the best police practices that he learned throughout his career to benefit Goodwin and its neighbors. Edward Casares graduated from Goodwin College’s Homeland Security program in June of 2009. Casares, the first in his family to obtain a college degree, credits Goodwin in large part to his personal growth and professional development. In the 1980s, a lawsuit was filed in Hartford by La Casa De Puerto Rico regarding a 12-year-old child who passed away from being buried under debris, unable to be rescued due to a language barrier. The settlement included the hiring of 50 firefighters, 25 of whom needed to speak Spanish, to prevent a similar incident from happening. At 21, Casares was hired by the Hartford Fire Department under this settlement. He worked his way up in the department, but even with training and many certificates in the field, he felt like something was missing. “There was some emptiness there. I didn’t have a degree. A degree leads to credibility. It means you have met the standards and qualifications,” Casares stated. His classmates and teachers kept him focused and on track. “Other students motivated me to do better. The instructors took the time to meet with me and made me feel like this is where I belonged. They had compassion – along with certain toughness –­ that I needed and the students wouldn’t let me fail,” Casares said. Casares started out as Deputy Fire Marshal and worked his way up gradually to Fire Marshal, a position he held for half of his career in the Fire Prevention Division. His Homeland Security degree gave him the credentials and skill base to apply for Chief. “I had a good foundation and was promoted to Chief of Department and Director of Emergency Management,” Casares recalled. As the first Puerto Rican ever to be promoted to Chief in the 150-year history of the Fire Department, Casares was responsible for almost 400 employees and a $32 billion dollar budget and was the city’s Emergency Manager. “My favorite part of the job was getting things done and seeing the end result. The department was great when I got there, and I wanted to continue on that path and constantly improve,” Casares said. After graduating with his associate’s degree from Goodwin, Casares was motivated to continue on this path of growth and education. On October 25, 2013, Casares graduated with his bachelor’s degree in Fire Science from Columbia Southern University. Casares was later asked to represent Goodwin alumni on the College’s Board of Trustees. “I sit in the boardroom with talented individuals, and we talk about how they are helping the school grow. As an alumni, I bring an additional point of view,” Casares said. Recently retired, Casares is hoping to give back to Goodwin in the years to come. “I would like to come back and teach public safety,” Casares said. 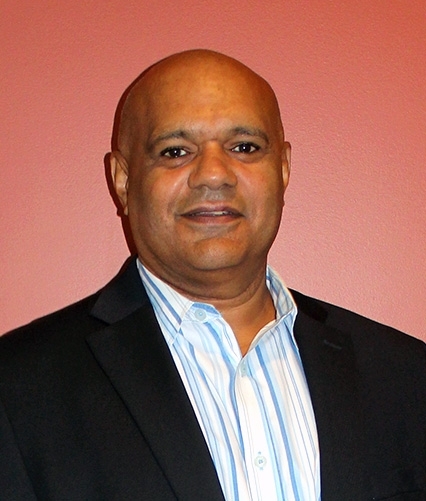 Casares proves that going back to school later in life can lead to unlimited success and fulfillment. “Goodwin lays out a plan and shows it’s possible. For every excuse I had to not do it, they had a plan of how I could. Coming to Goodwin was the best thing I’ve ever done for myself,” Casares said. 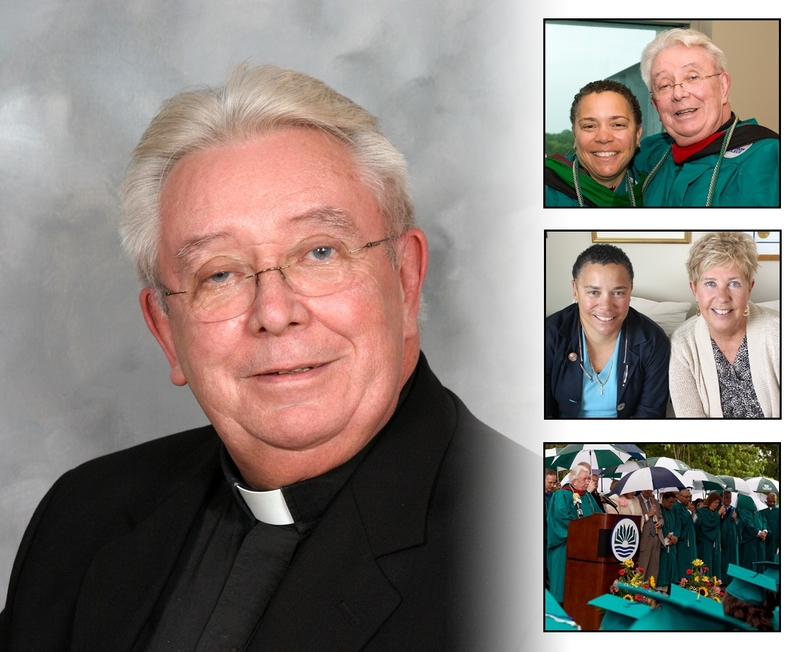 When Reverend Father John Rohan passed away at the age of 67 on January 20, 2013, Goodwin College lost a beloved friend, trustee, benefactor, and mentor. And although the physical presence of the man no longer walks the campus, he has – in a gesture indicative of his love for the College – found a way that his spirit of caring remains among us every day: a generous bequest of $25,000 to support the Goodwin College Endowed Memorial Scholarship Fund. Through this thoughtful, planned gift, the largest of its kind realized in the College’s short history, Father Rohan has helped to ensure the future of Goodwin and financial support for many deserving students. Two of his dear friends, Ann Zajchowski, executive assistant to Goodwin College’s president, Mark Scheinberg, and Dr. Maria Ellis, physician at Woodland Women’s Health Associates and chair of the Goodwin College Board of Trustees, met recently to share fond memories and stories about Father Rohan and his vast contribution to others. Father Rohan grew up in Manchester, Connecticut, where one of his earliest friends was Zajchowski, both communicants of St. James Church. He went on to graduate from St. James School and St. Thomas Seminary before continuing his studies for the priesthood at Christ the King Seminary at St. Bonaventure in New York. He was later ordained to the priesthood in 1972. “Church was without a doubt the center of our lives, and his calling came when he was incredibly young. Many priests east of the River were first generation. They formed lasting friendships,” Zajchowski explained. Father Rohan was appointed as pastor of a cluster of the East Hartford North Churches: St. Rose, St. Isaac Jogues, and St. Mary’s. Under his leadership, the parishes came together, yet each community maintained its own identity. “He was very devout and had deep religious beliefs. His sermons were always literary and thoughtful. He set an example by being 100 percent committed,” Zajchowski noted. Ellis, who was raised Episcopalian, often went to listen to Mass at St. Francis of Assisi Church. Not being able to receive Communion, she would sit in the back pew. “I became his crusade. The best thing I did for myself was to become a Catholic. He changed my life,” Ellis recalled. Father Rohan had a profound effect on the Goodwin College community as well. For many years, he served as a trustee and chairman of the Academic Committee. He was also responsible for linking the College with the local Ghanaian community. “Just as he combined parishes, he was an expert at connecting people. He would stand back and watch it happen. He had a tremendous dedication and love for Goodwin. He was so proud of how the College evolved,” Zajchowski stated. Father Rohan believed access to quality education was central to alleviating poverty and changing lives. “He resonated with the kind of student we support. He was willing to let you in and guide you just as Goodwin College opens the doors to those who want to make an effort and change their lives,” Zajchowski said. President Mark Scheinberg often referred to Father Rohan as a “role model and moral compass” who brought positivity and joy into the lives of many. “Father embraced our different and diverse students and saw himself as their spiritual leader. As a trustee, he was a generalist with a broad, diverse knowledge base. He always focused on what was meaningful and would encourage the board to remember the College’s purpose,” President Scheinberg stated. Father Rohan’s generosity and compassion were evident in all that he did. “You got the sense that he wasn’t looking down on us, but rather opening his arms and reaching out,” Ellis commented. He was always a shoulder to lean on, offering support and empathy in times of need. One Christmas, Ellis was unable to go home for the holidays due to her work schedule. Feeling homesick, she decided to take Father Rohan’s invitation and attend a Mass he was saying. As the service concluded, he asked the nuns to sing an a cappella version of “Oh Come All Ye Faithful.” “He picked my favorite Christmas hymn even though it was not in the program. That was his Christmas present to me,” Ellis recalled, smiling. Father Rohan’s legacy is multi-faceted and will live on through Goodwin College and everyone who was made better by knowing him. Congratulations to Chip Thermer, Manufacturing Program Administrator, who was profiled in the online newsletter of the Manufacturing Skills Standards Council (MSSC). Chip and his colleagues are doing incredible work not only in providing a meaningful curriculum for students, but also in promoting the program to potential employees in manufacturing who are looking to fill job openings with the next generation of skilled manufacturing workers. See the MSSC column on Chip here. EAST HARTFORD – Since its inception in July 2013, Goodwin’s Riverside Farmers’ Market has benefitted many in its mission to provide fresh produce to consumers in the East Hartford and Goodwin community. As the Riverside Farmers’ Market comes to an end for the season, Goodwin College looks forward to growing and expanding in years to come. The market, which included multiple vendors selling fresh produce, herbs, cut flowers, sauces, and all natural shea butter products to the public, is a participant in the Farmers’ Market Nutrition Program for WIC and SNAP recipients and senior citizens. 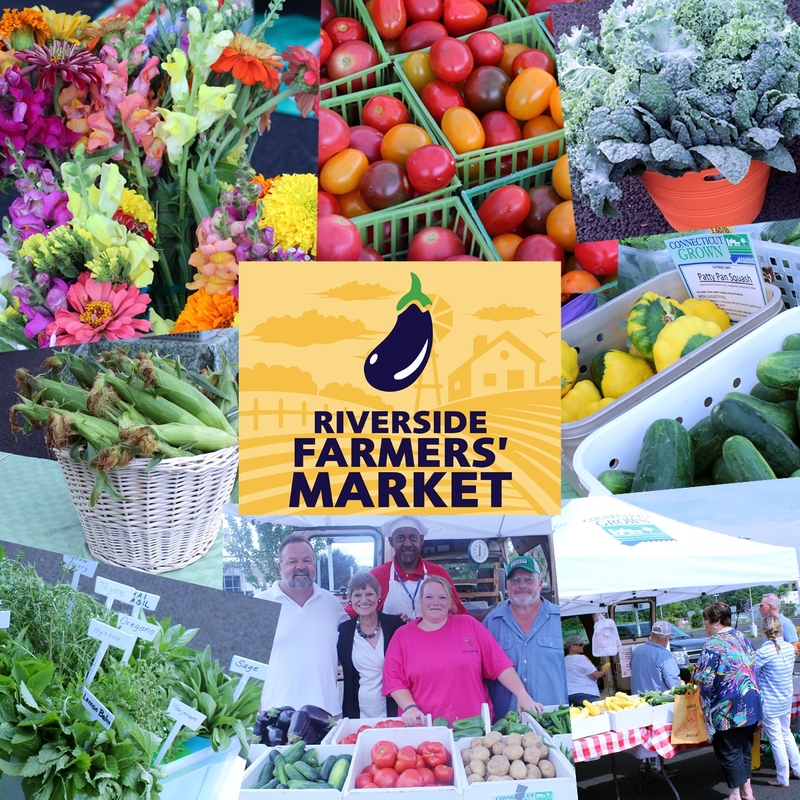 The Riverside Farmers’ Market, along with another Goodwin initiative, the Community Garden, has been instrumental in supporting the common cause of Goodwin’s Transitions Food Pantry. The pantry strives to remove hunger as a concern for Goodwin students by soliciting, collecting, and distributing food to those in need. A number of students find it difficult to meet their financial obligations and support a family while attending school. “Goodwin’s Farmers’ Market is different from any other market because there is no fee for the vendors. We only ask that they donate to Goodwin’s Transitions Food Pantry,” Sandy Pearce, Goodwin College Webmaster, said. Pearce has played a large part in organizing and maintaining the Community Garden and Riverside Farmers’ Market. Pearce brings the generous donations to the Food Bank and whatever is not needed at the time is shared with St. Rose’s Church in East Hartford. Unity Farm, a participant in the market, donated a portion of their unsold vegetables to Transitions Food Bank. “I truly believe we should help people in need. I’d hope somebody would help me if I needed it,” said Kelly Jacobs, a member of Unity Farm. “When you give back to the community, you are a part of a positive change. It connects you with those in need. You are a part of improving their quality of life and empowering them to believe in a better future. It’s heartwarming to see the domino effect that giving back has on people,” Pearce said. Since July, the College has collected almost 140 pounds of food to be donated to those in need. “Consumers have said wonderful things about the market. It can be difficult for some to buy produce in grocery stores because of the expense and for those who use SNAP and WIC, it isn’t accepted. The coupons are specifically made for use at farmers’ markets,” Pearce said. Fresh produce can be hard to come by. “I grew up on a farm and know how important it is to have fresh fruit and vegetables. We began the Community Garden in 2012, where our students, employees, and neighbors in East Hartford are able to grow and pick their own produce. A Farmers’ Market seemed to go hand-in-hand with the garden,” Pearce stated. As a result of the success of the market, Goodwin will be hosting an indoor farmers’ market on Tuesday, November 26 in the Community Room and Lobby. There are 12 vendors booked for the Winter Farmers’ Market so far. There are farmers with a full range of Connecticut produce including fruits, vegetables, sprouts, and micro-greens; cheese; meats (bison, pork, beef); raw milk; eggs from pastured hens; maple syrup and honey products. The list will continue to grow as the market approaches. WIC and SNAP will be accepted. If you are interested in participating in Goodwin’s Farmers’ Market, please contact Sandy Pearce at SPearce@goodwin.edu. 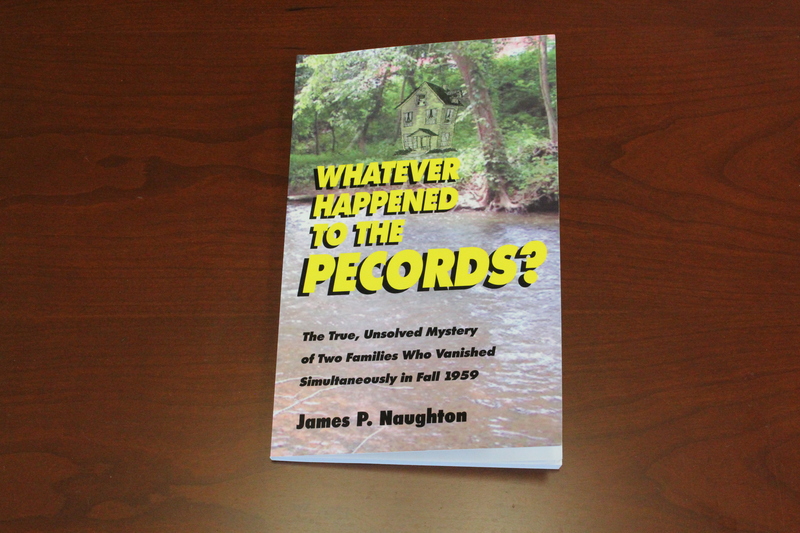 Author James P. Naughton attempts to solve a longstanding mystery in his latest book, Whatever Happened to the Pecords? The story, which has intertwined with Goodwin College’s development and expansion, is the subject of an upcoming book signing and reception with the author. On Wednesday, October 16, the College will host an event featuring Naughton, a native of East Hartford. The two-hour book signing and discussion begins at 5:30 p.m. In addition to his latest book, Naughton will also discuss and sign copies of his self-help book, Jump in and Start Swimming. The event is open to the public. Pecords is a story interwoven with the history of East Hartford and a home on Colt Street where the title family lived. On a fall evening in 1959, Naughton was collecting money on his paper route, and upon stopping at the house, he found that the family appeared to have abruptly vanished. East Hartford, including photos and references to familiar places in town, features prominently in the story. The Colt Street home, located on the banks of the Connecticut River, was connected to Samuel Colt and the Colt Street Ferry, which provided factory employees with a direct crossing to the iconic arms manufacturer. Naughton graduated from East Hartford High School in 1962. He is an alum of Central Connecticut State University and the founder of the JP Naughton Sales Performance Company. The October 16 event will be held in the Community Room, where seating is limited. The event is offered free of charge, but RSVP is requested. All interested in attending should contact Sarah Burgess at sburgess1@goodwin.edu or by phone at 860-727-6791. Goodwin College’s unveiling of a multimillion dollar renovation of 403 Main Street drew praise from local civic and business leaders as they toured the facility on Thursday, September 26. The $4.4 million expansion and renovation has become home to many of the College’s Health Science programs. Very soon, it will house two important new programs for Goodwin – Dental Hygiene and Ophthalmic Science. The building is located on the south end of Main Street in a part of East Hartford that the College has not only expanded into, but done its part to revitalize and improve. To celebrate the completion of the project, as well as the addition of the programs, Goodwin held a three-part event. A traditional ribbon cutting took place, followed immediately by an East Hartford Chamber of Commerce Business After Hours. Before and during the party, former Governor John Rowland remote broadcasted his drive-time WTIC News Talk 1080 radio show from what will soon be the dental clinic reception area. 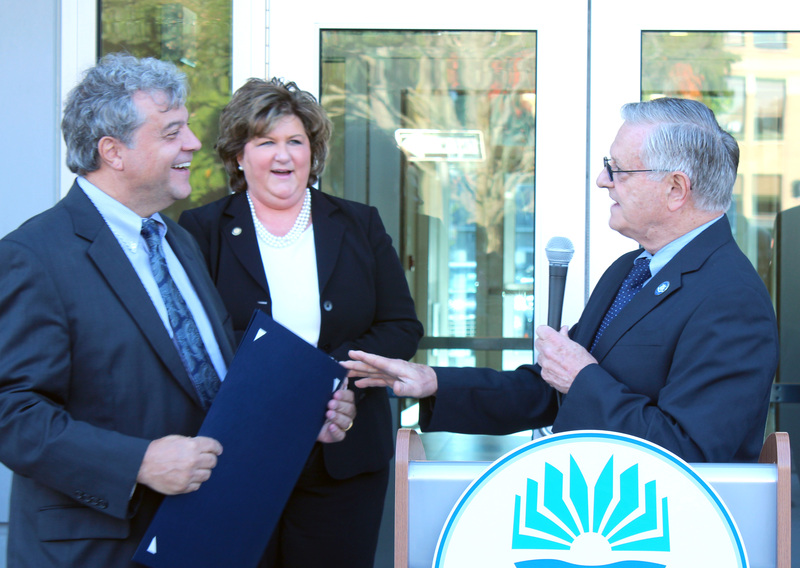 State Rep. Henry Genga of East Hartford presents Goodwin President Mark Scheinberg with a proclamation from the Connecticut General Assembly. East Hartford Mayor Marcia Leclerc looks on. “It’s a beautiful building and what we’ve you’ve done in East Hartford from an economic development beautification standpoint is quite extraordinary,” said Rowland of the new facility. Programs such as Medical Assisting and Occupational Therapy Assistant have been underway in the building since it opened at the start of the fall session. 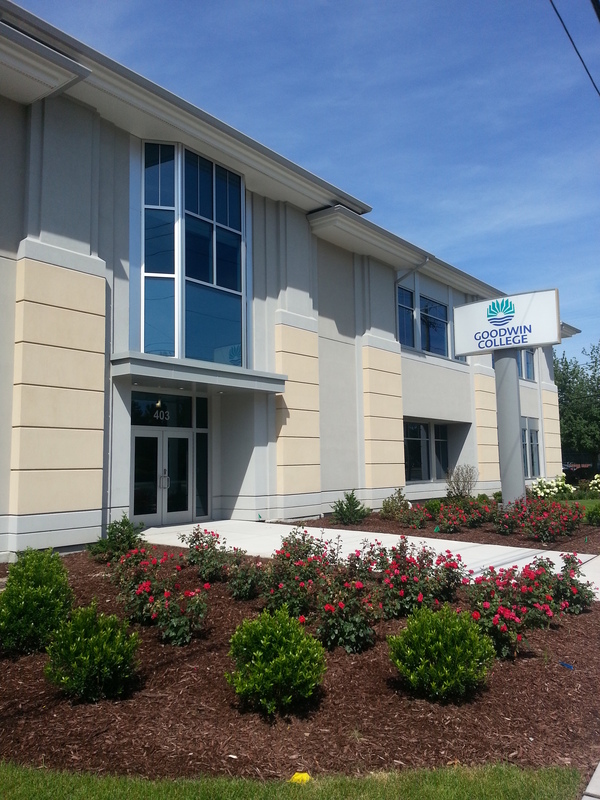 The building establishes a permanent home for such programs, which have moved from facility to facility while FIP Construction completed the renovation. East Hartford-based Capital Studio Architects designed the façade and interior upgrades. “This facility, designed and constructed by Connecticut-based companies, along with the recent opening of your Early Childhood Magnet School, are testaments to your emphasis on community that will continue to bring a positive impact to our residents,” Congressman John Larson wrote in a letter to Scheinberg. Two of the most prominent features of the project will benefit the upcoming Goodwin programs. Goodwin is in the final stages of accreditation for the Dental Hygiene program and prospective students can begin prerequisite courses in the spring session. Once the program begins, students will utilize a full clinic with 14 chairs, drawing people from throughout the community for cleanings, X-rays, and oral cancer screenings. “We’re teaching people how to go into these fields – which are high paying fields – while providing clinical services to area residents who may be uninsured or underinsured at little to no cost,” said Scheinberg. Soon, this store will be full of eyewear crafted by Goodwin College students. The Ophthalmic Science program will train students to craft eyeglasses and fit contact lenses. Like the Dental Hygiene clinic, a new optical store will open facing Main Street. 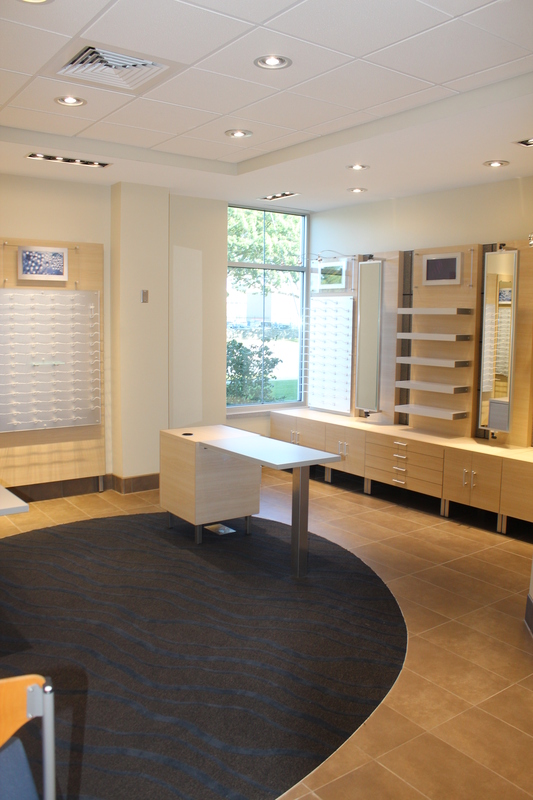 Once open, the store will offer discounted eyewear to the community.